Calling all translators! (And Translation Checkers) We need your help! 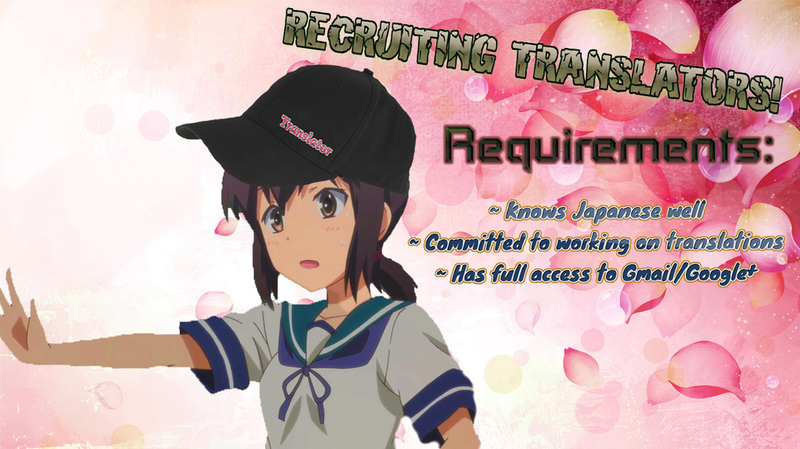 We are requesting for more staff and members to help translate Sakurasou No Pet Na Kanojo Visual Novel! Currently, All job positions (except for Image Editors now) are open! Stay tuned for more new job positions! If you wish to learn about each roles, click Learn More! If you wish to sign up as a translator, please fill out all a form here. Link will redirect you to a form on Google Drive. Update 6/8/18: We are dire in need for Translators to help us out translating! If you have the fundamentals of Japanese down, and are interested to help, please fill out this form! If you wish to sign up as a translator checker (or TLC), please fill out all a form here. Link will redirect you to a form on Google Drive. Update 6/8/18: We would like more people to help proofread or correct some spellings/grammar issues. If you wish to sign up as an editor, please fill out all a form here. Link will redirect you to a form on Google Drive. Update 8/4/15: We are in no need for Image Editors. All of the images are finished being edited. Sorry about that. If you wish to sign up as a hacker, please fill out all a form here. Link will redirect you to a form on Google Drive. Update 5/4/16: We are in no need for Hackers anymore. Sorry about that.